The traditional medical id bracelet, confined bracelet itself size, can only record very limited information, such as engrave “diabetes”, “allergy”, etc., or simply customize the name and telephone, and once customized, can not be modified, If you want to record more personal the necessary information, it will not do anything! Technology makes it all changed, appear NFC technology, so worn electronic medical id bracelets become a reality! And the successful solution of the NFC chip anti-metal, resistant to water problems. 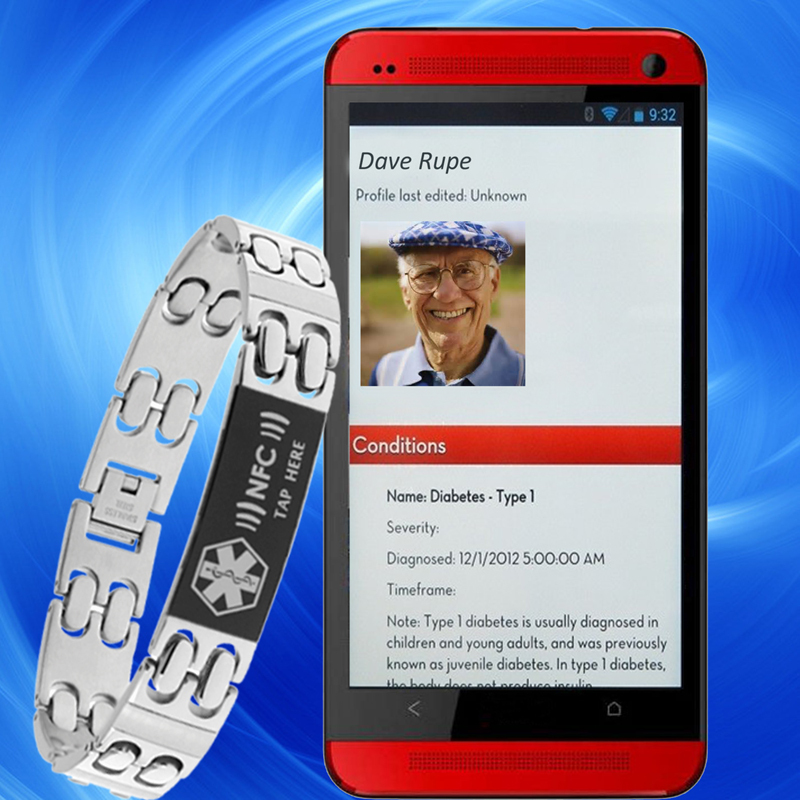 for traditional medical id bracelet adds a modern technology! 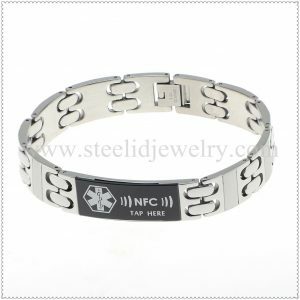 NFC ID bracelet What can give you? Our NFC chip itself has 144 bytes of storage space, you can use it to store your personal medical information, storage capacity far exceeds traditional medical id bracelets! You can record more! Any have NFC functionality smart phones, tablet PCs can easily be done (except Apple). 144 bytes NFC chip itself may not be enough to satisfy your information is stored, no problem, you can also use cloud storage! In your cloud space to write your personal health information, pictures, hospital medical records, X-rays can also be! 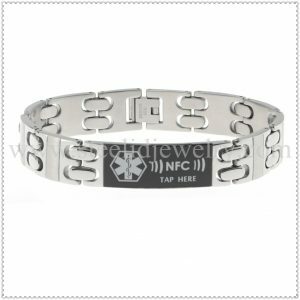 Once you have an emergency, ambulance personnel just use smartphone tap your NFC bracelet, them can read all of your medical information! When your get this NFC ID Bracelet,you can to set it up, just visit your phone’s app store, and download one of the many great NFC encoding apps, which allow a user-friendly experience in making the NFC Bracelet work for you! We’re definitely not the first people to think about putting an NFC chip in a bracelet. You might even already own such a bracelet! We think the problem with these bracelets is that 99% of them are made of silicon. This is a cheap and solid solution! We first putting an NFC chip implanted into stainless steel bracelet, which is a combination of art and technology, it is to meet the people of the traditional beauty bracelet pursuit, but also joined the ingredients of modern technology, we believe that it will in the next one or two During the year, will be the majority of people accept it and love it! This entry was posted in New Medical ID Bracelet and tagged NFC bracelet, NFC ID Bracelet, NFC Medical.